In any given week, how many sales emails do you get from companies you’ve never heard of, toting solutions to problems you may not even have? If you’re anything like me, it’s A LOT. (Praise be unto the spam folder.) The frustrating thing about sales pitches is that they’re often packed with catchy phrases and misleading statistics to convince you that you #NEED their product or service. But oftentimes, you aren’t even in the market for what they’re selling or aren’t yet in a position to buy. The result? A waste of two people’s time and a cluttered inbox. No bueno. Rather than waste your efforts fruitlessly chasing random leads online, focus on attracting your ideal customers or clients to you. This seems like an obvious statement, but knowing where to start is easier said than done. 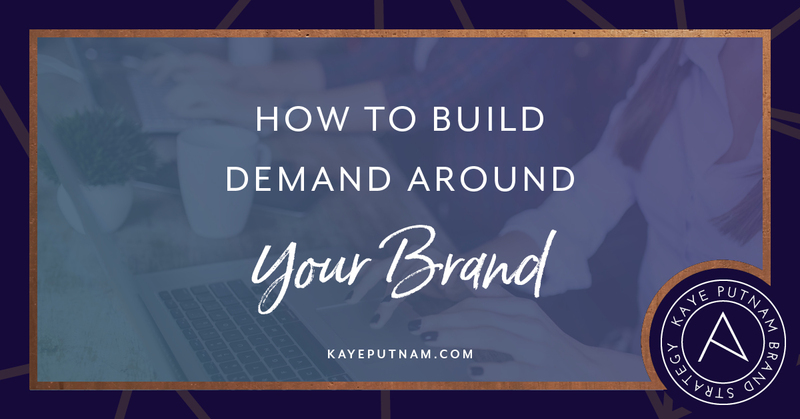 Building a magnetic brand with a strong following takes time, but with these steps, you can position yourself in the market to attract your biggest brand fans without pushy sales tactics. Remember how Kelis’s milkshake brought all the boys to the yard? Notice how the lyrics DON’T say, “My cold email sequence brings all the boys to the yard.” or, “Door-to-door solicitation brings all the boys to the yard.” Nope. It was her milkshake that had them dropping by in droves. (Well, that and probably a few more sinister things… but you get the idea.) With a killer product or service and a strong brand identity, clients WILL come to you. It’s tempting to look at successful entrepreneurs in your space and mimic what they’re doing, but that isn’t how you build an authentic brand. The best brands are the ones with a strong identity – even if that identity isn’t for everyone. The same way that not every client is a good fit for you, you won’t be the right solution for some. THAT’S OKAY. By honing in on your most natural gifts, you can do your best work without sacrificing your sense of self. After all, your brand is a reflection of your unique personality and skills. So, show it off and attract the perfect clients for your individual biz style. The internet is absolutely swarming with businesses selling their products and services. To convince people to buy yours instead of the thousands of other options out there, you’ll need to get in front of the right audience. Gaining visibility online may seem like a daunting task, but there are plenty of ways to increase brand awareness (many of which are totally free!). From blogging (to provide value and up your SEO ranking) to social media marketing, advertisements, community outreach, and more – your audience is just waiting to find you. Make it easier on them by using targeted content and advertisements to reach your desired clientele. Get ’em in the feels. Even if you’re spouting out super valuable intel, it won’t make the impact you’re hoping for unless it prompts an emotional response. Emotion is the #1 driver of brand loyalty, so make your audience feel something. Whether you’re exciting them, tugging at their heartstrings, or motivating them with powerful messaging, it’s crucial that your audience feels emotionally attached to your voice. Remember: behind every brand is a person or group of people. Don’t be afraid to show humanity in your business. The more YOU that can be seen and heard, the better results you’ll see. When it comes to creating valuable content, there’s more to it than providing great information and prompting an emotional response. The best content out there doesn’t stop at interesting or helpful; it positions you as an expert, someone your readers can trust and rely on. So if you’re planning to put out a blog on your go-to method for creating a content calendar, take it one step further and create a free downloadable template to walk your readers through the process step-by-step. Value comes in many forms, so don’t be afraid to do a little handholding whenever possible. Your audience will thank you! One of the biggest problems that many solo/entrepreneurs face is that they try to do too much or be too many things. It’s great to be a Jack-of-all-trades, but it’s better to kick booty and take names at what you do best. When you carve out your specific niche and build your biz around your greatest strengths, you’ll be most useful and get your highest praise from clients. By focusing on specific services that you rock the house at, you’ll hone your skills with every new project and position yourself as an industry pro in no time. And guess what that means? PREMIUM PRICING, BABY! I’ve found that one of the very best ways to attract your ideal clients is by giving away freebies that spark their interest. Whether it’s a downloadable eBook or PDF in exchange for an email opt-in, a sponsored contest on social media, or just stellar advice on a regular, reliable schedule – give your audience something to remember you by. Free downloads and contests are an excellent way to build your email list with relevant leads without spending too much of your hard-earned cash. When it comes to building trust, you’ll need to give your time away rather than throw around money. Develop relationships with your clients (and prospective clients) online. Engage with them on social media. Send them emails. Show them some love! The more they learn about you and your expertise, the more likely they are to think of you when their next project comes up, refer you to a friend, or reach out to YOU for help instead of Google. We just talked about giving away your time… and if you were thinking, “GIRL, what are you, crazy? I don’t have any time to give!” I hear you. I know how difficult it is to juggle all of the various tasks involved in running a business and still manage to maintain a relationship with your audience (or the other humans in your household, for that matter). But the good news is, there are SO many systems out there to make your work life easier and clear up time in that hectic schedule of yours. A while back, I wrote about 5 systems I use that make it look like I’m on a 24/7 grind, but there are thousands more where these came from. In addition to saving you an insane amount of time, automated systems also boost your credibility by making you look like a total pro. Think about it… would you rather have to email someone to schedule an appointment or just book a timeslot online? Would you rather manually onboard your clients in an hour-long Skype call or get the basic questions out of the way with an interactive form? Customized automations create a better experience for both you and your client. Plus, let’s be honest. NOBODY wants to log into Facebook, Twitter, LinkedIn, Google+, etc. a million times a day to post when they could throw the content into an auto-scheduler and hit the beach instead! Give yourself the gift of time. Those automated systems I was telling you about? They’ll be your new BFF when it comes to attracting and nurturing leads. By releasing targeted content out there into the web, you’re enticing readers to click, read, download, or share… but the funnel doesn’t stop there! Let’s say you just published a new blog on managing invoices and expenses. Rather than post it and call it a day, you create a free downloadable finance worksheet and boost the post on Facebook to a select audience. Someone clicks. They read. When they go to download your free worksheet, that’s your chance to capture their email address. They opt-in, and BOOM! Immediately, you’re emailing them a warm welcome! Once they’ve subscribed to your emails, you can enter them into an entire sequence to educate them on your services and convince them to buy… and you won’t have to lift a finger! Selling isn’t about chasing, it’s about being found. While you may have had to chase down clients at the very beginning of your business, it isn’t a sustainable process for acquiring customers. It’s too much time, money, and effort that could be better spent on other things. Frankly, it can be exhausting and lead to a pretty severe burnout. It may seem difficult now and it won’t happen overnight, but by giving your audience the best possible experience and GIVING AWAY value, you’ll become more and more visible each day. Distinguish your brand with your unique personality. Don’t be afraid to stand out! Your individual strengths and style will guide you to your perfect audience. Come out, come out, wherever you are! Don’t hide away in the shadows of the ‘net. Put yourself out there with regular content, targeted advertising, and community/industry involvement. Take an emotional approach. Share stories. Foster a meaningful company culture. Show your clients that you can take them to that place they’re dreaming of. Offer more value than the next guy. While you may be writing about the same things or touting the same services, you can up your value with helpful guides, videos, and worksheets. Meet a special need. Your business is no place to be vague. Find a way to include a unique niche or solution into your services. Your perfect clients will be THRILLED to see that you specialize in exactly what they’ve been looking for. Spend time ON and WITH your audience. Offer free goodies to generate leads and add value for your prospective clients… but don’t stop there. Foster a meaningful relationship by engaging with your audience regularly. Leave some things to the robots. There’s a reason why robots are stealing our jobs (only half kidding) – there just aren’t enough hours in the day to manually do all of the things we need to do to scale and maintain our businesses. Get by with a little help from your electronic friends. Trust me, you’ll be happy you did. 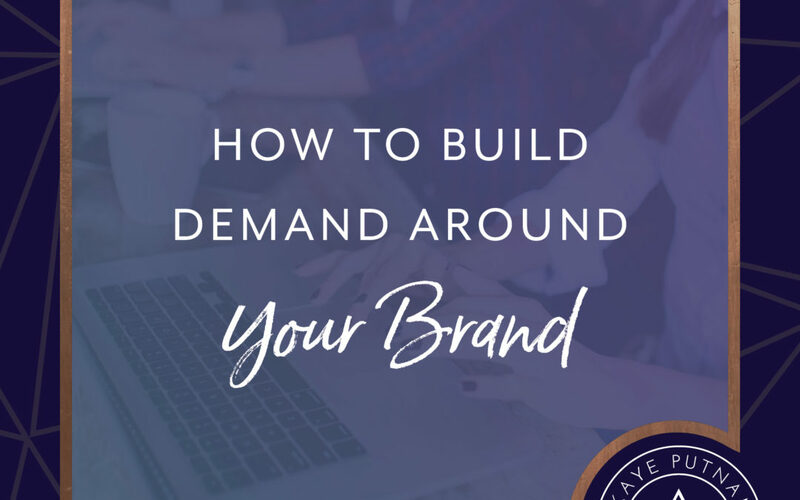 With these steps as your guiding priorities, you’ll see a more genuine interest in your brand, better-suited leads, and boundless growth potential. The most important thing is that you remember who you are, what you’re worth, and how you can help. With the right combination of confidence and clarity, you can finally stop chasing leads and let your clients do the discovering. 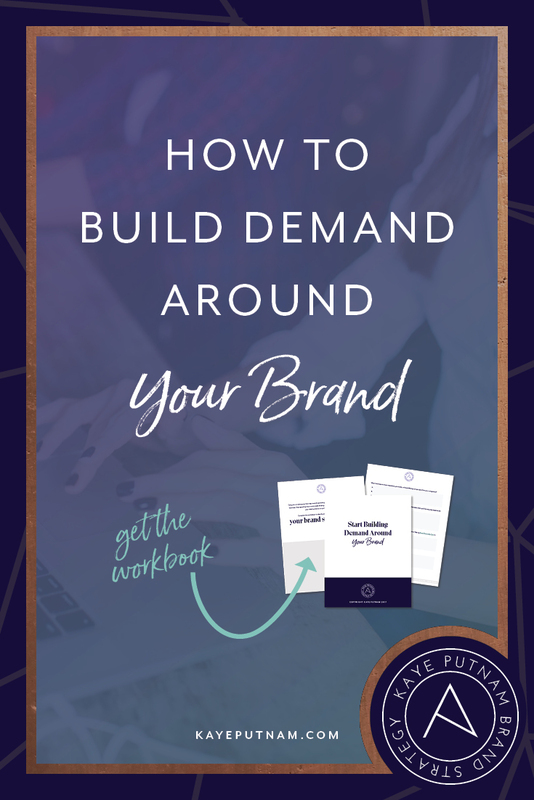 Get the workbook to start building demand around *YOUR* brand today!